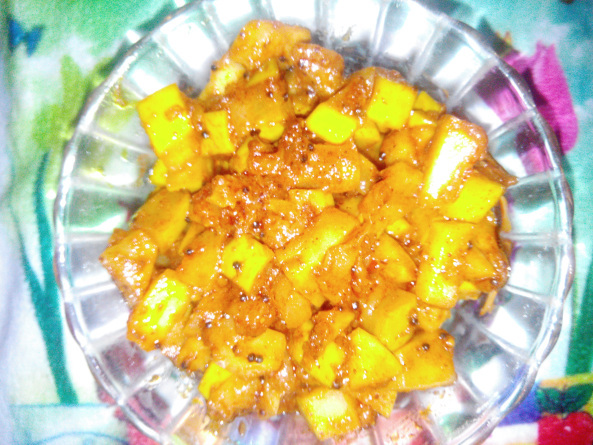 Instant Mango Pickle, this is an easy way of making pickle instantly. Usually, when we prepare pickles we will be mix mangoes and rock salt and allow it to marinate for days. In this case, we just marinate the mangoes for half an hour then we will start preparing the pickle. The mango to be used for this pickle is up to ones choice, it tastes better with sour mangoes. 1. Raw Mango – 1 No. 2. Fenugreek (Vendhayam) – 1/4 tsp. 3. Mustard - 1/2 + 1/2 tsp. 4. Red Chili Powder – 1 tsp. 5. Asafoetida Powder – 1 tsp. 6. Gingelly Oil – 3 tbsp. 1. Wash and pat dry the mango. 2. Cut the mango into small pieces. 3. Take a bowl and add the mango pieces and salt, mix well. 4. Let the mango pieces soak up in salt for about 30 minutes. 5. In the meantime, dry roast 1/2 tsp mustard seeds and fenugreek seeds and grind it to a powder. 6. After 30 minutes, heat oil in a heavy bottom pan and add mustard seeds. 7. Once the mustard splutters, add the asafoetida powder, mustard-fenugreek powder, chili powder and mix it for few seconds. 8. Now, add in the mango pieces and toss well. Adjust the salt if required. 9. Cook the mango on a low flame for about 10 mins. Do not close the pan. 10. Switch off the flame after ten minutes and wait till the heat reduces to room temperature. 11. Transfer the pickle to a dry glass jar. 12. Mango pickle is ready to serve. Tastes great with any kind of rice variety.